Diabetes in Cardiovascular Disease is a current, expert resource focusing on the complex challenges of providing cardiovascular care to patients with diabetes. 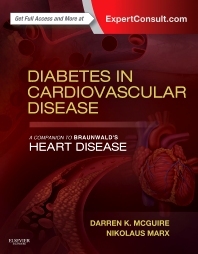 Designed as a companion to Braunwald’s Heart Disease, this interdisciplinary medical reference book bridges the gap between the cardiology and endocrinology communities of scientists and care providers, and highlights the emerging scientific and clinical topics that are relevant for cardiologists, diabetologists/endocrinologists, and the extended diabetes care team. Access essential coverage of basic and clinical sciences, complemented by an expanded focus on epidemiology, behavioral sciences, health policy, and disparities in health care. Take advantage of a format that follows that of the well-known and internationally recognized Braunwald’s Heart Disease. Review the best available clinical data and pragmatic recommendations for the prevention and management of cardiovascular complications of diabetes; national/societal intervention strategies to curb the growing prevalence of diabetes; and the current pathophysiological understanding of cardiovascular comorbidities in patients with diabetes.